August 3rd, beginning Wednesday evening with the opening film Linsanity and a festival gala. The festival's calendar of films and events can be found here. The opening night featured Linsanity, the documentary which played at Sundance and multiple West Coast Asian American film festivals earlier this year. The film was directed by Evan Jackson Leong, whose past quality works have included the documentary about Better Luck Tomorrow. The documentary was originally funded through fans as a Kickstarter project, then picked up as a Sundance selection, and just this week it was announced that the film was picked up for distribution in movie theaters on the East and West coasts starting October 4th. As has been covered in prior reviews, the film is a real crowd pleaser. The documentary reveals unprecedented, behind-the-scenes footage of Lin and his family starting from old childhood videos, to his Harvard days, to making it in the NBA, while also covering important societal roadblocks and challenges along the way. During the film's darkest moments, it was striking how close his dreams almost died and just how hard it was to mentally overcome almost everyone having such low expectations and limited opportunities toward him. The film is extremely popular, currently sitting with a 8.9/10 on IMDB and a 94% audience rating on RottenTomatoes. 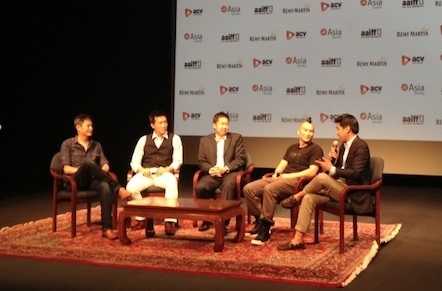 During the post-screening Q&A, ESPN's Pablo Torre moderated a panel which included Leong as well as producers Brian Yang, Christopher Chen, and Allen Lu. The panelists noted how Lin's life seems to repeat itself in cycles at every (bigger) stage, in which he is repeatedly discounted and undervalued since he doesn't "look the part", and then ultimately proves his naysayers wrong. Lin's mother noted in the film that Jeremy does not get respect, that if he outplays his opponent, then the "experts" think his opponents weren't as good as previously thought instead of giving any credit to Lin. Also in attendance at the screening and gala were his old Harvard assistant coach, who first encouraged him that he had NBA-level talent, as well as Joseph Lin (Jeremy's brother) and his fiance. Producer Brian Yang was honored during the evening by the sponsor Remy Martin, with an achievement award in film and television. The festival will feature many other quality films worth supporting. The closing night film is Our Homeland, and the festival also features a special series of Taiwanese films over the weekend. Tickets can be purchased online from each film's individual AAIFF page, or in person at the venue, or by calling 212.989.0017.